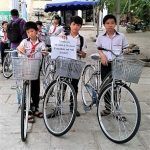 We donated 3 Bicycles this Christmas to a wonderful program that was set up by LTH (one of our suppliers in Melbourne). 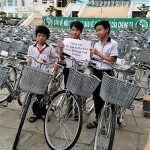 This wonderful program was set up by Loi and Sarah and gives bicycles to school children in Vietnam who have long distances to travel each day to their schools. This program has been running for a few years now and we are so happy to be apart of this and are so proud to see these photo’s of the recipients.